There are times when you have to move beyond the chicken to truly experience the nuanced flavors of poultry, and a meal with the perfectly cooked duck is a moment to treasure. It is true, that duck is more expensive than chicken, but cost isn’t everything. Think about what duck meat offers that the others do not: it contains higher amounts of iron than other poultry, it is an excellent source of zinc and selenium too, and the rendered duck fat is simply divine. Taste-wise, it is as good as it gets! Combine this marvelous protein and fat with fresh asparagus, and you have a meal fit for royalty, so treat yourself to the very best! When asparagus is in season, opt for the best bunch. How to choose it? Use your sense of touch to avoid stalks that are overly woody, and use your eyes to pick out firm bright-green stalks, or spears with a tinge of violet. Once you get it home, keep it fresh by trimming the bottoms and wrapping the cut ends with a damp cloth or paper towel. If it turns out that you adore the flavor of duck, and you will, then we don’t want you to miss out on trying pan-fried duck breasts with grape sauce. It is a hidden gem that adults will love and Paleo children will greedily tuck into. Who doesn’t love a hint of sweet with a healthy serving of delicious fat? In a small bowl combine the garlic, ginger and five-spice powder; season to taste. Rub the mixture onto the duck breasts. In a cast iron skillet, melt the cooking fat over medium-high heat and sear the duck breast, skin side down, for 4 to 5 minutes on each side. Transfer the skillet to the oven and roast for 7 to 8 minutes, or until you reach desired doneness, then let rest. Add the asparagus to a skillet with melted cooking fat over medium heat, stirring for 4 to 5 minutes. Pour balsamic vinegar and season to taste, stir until well combined, and cook for another minute. Remove from the heat and cover for a few minutes, allowing the flavors to develop. 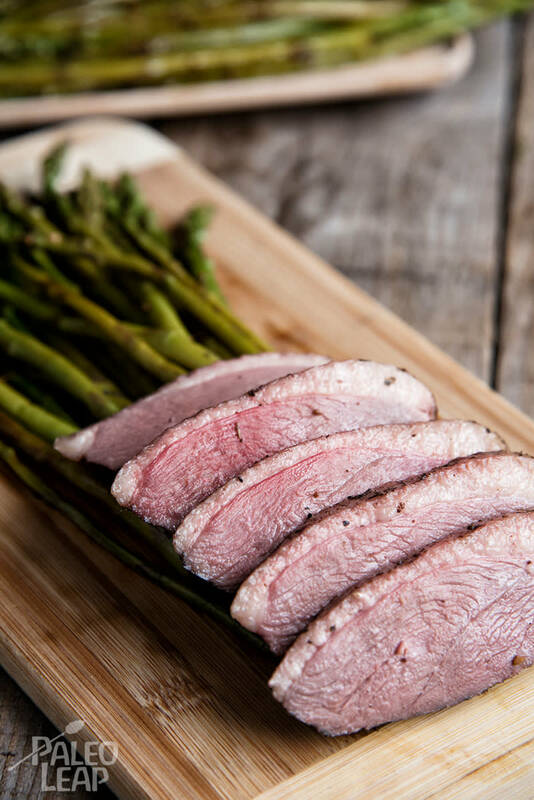 Cut the duck breasts into thick slices and serve with the asparagus.